This park is located on Park Drive just off of east State Road across from the Grant Elementary School. Blanche Lake is great for fishing, whether from the 144' of docks (docks installed in May) or from a boat. The boat launch is available seasonally and makes it easier to get boats in and out of the lake. A 40' swim beach to the east of the boat launch was completed in the summer of 2012. We have most recently added L.E.D. lights throughout Blanche Lake Park, and some surveillance. In May 2013, two new 15' player benches were installed at the ballfield as well as a set of used bleachers for spectators. The City of Grant received a $56,000 grant for the construction of an amphitheatre at the Park. In 2009, the City brought in PLM Lake and Land Management to conduct a survey of Blanche Lake and make recommendations of management strategies to improve the lake over time. If you have been down to Blanche Lake since early September, you will clearly notice two large sections of cattails have been sprayed by PLM through the permit process and subsequently cut down. We remain hopeful to find some funding source to partner with so that we can make a significant lake restoration effort in the future for generations to enjoy. Families and visitors should have a clean restroom to use when visiting the lake. If you notice anything on the Blanche Lake Park grounds requiring immediate attention, please contact the Department of Public Works or phone them directly at (231) 834-7462 to let them know about your concern. Please note that anonymous complaints cannot be properly resolved. The DPW checks parks regularly. Any concerns found in the afternoon/evening should be reported immediately to the link above or calling (231) 834-7462. We invite visitors with dogs to enjoy the lake park setting, and we ask that you keep your dog(s) on a leash for the safety and enjoyment of other visitors. Groups interested in hosting events at the amphitheatre are asked to contact the City of Grant municipal offices directly. The City Commission partnered with local businesses to host several Movie Night in the Park events, although nothing is scheduled for summer 2017. There is no cost to utilize this newer facility. The City will allow users to check out a restroom key for any one day or weekend planned events. Please contact City Hall no later than the Friday morning before your gathering for to make arrangements to check out a bathroom key. For many years there have been upper and lower trails available to use at Blanche Lake Park. 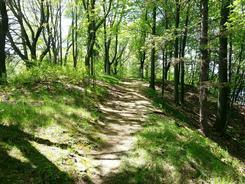 If you have a group looking for a great place to volunteer, our Blanche Lake Park trails could use some attention. We always need help hauling out brush, painting picnic tables, raking the upper trails from one end to the other, and cleaning up the park grounds. Please contact City Hall for more information. The Historic Wooden Water Tower is now home at Water Tower Park. This wonderful project would not be possible without the generous grant funding from The Fremont Area Community Foundation and many generous donations. The roof was restored and both donor plaques were placed, listing the names of every person who donated to make the project possible. The caboose was repainted, and the Chessie System logo was hand-painted separately. City of Grant taxpayer dollars spent on this project was $132.00. The Michigan Registry of Historic Places approved the plaque in December 2010, and once it was finished, it was placed in the park to celebrate this historic community treasure. The City of Grant's Water Tower Park is located in the center of the downtown business district along M-37, and while driving by you cannot miss it. The park features one of the last two historic wooden water towers remaining in the entire State of Michigan, an original Chessie System Caboose, decorative landscaping, picnic tables and park benches. A special thanks is given to the Fremont Area Community Foundation for their generous grant which made this entire project possible, as well as Milt Barr of Grant Welding, and Rich Ulrich of Detail Painting for their generous contributions to the project. Located 2 blocks off of M-37: Main Street to Lake Street, right to Brink Street, and left at Harold. The exact address is 85 Harold. "Know Your Limits, and Skate Within Them!" Please remind those using the park to abide by all of the rules. Tickets will be issued for littering, so remember to always use the trash receptacles. Also, visitors are strongly discouraged from bringing any questionable substances into the park. All activity is regularly monitored, and we want to ensure all of our visitors have an enjoyable experience. Please remember to stay out of the path of other users, and stay clear of the ramps while in use to avoid injury to yourself and other users. The reconstruction of the Skate Park removed all of the wooden supports and they were made out of steel. A special thanks to the Fremont Area Community Foundation which made the rebuild project possible. Another special thank you to Milt Barr of Grant Welding for the wonderful job he has done re-constructing the ramps out of steel! The rebuild has been completed, and entire Skatepark ramp surface received a fresh coat of orange paint and complements the black steel structure underneath. A special thank you to Rich Ulrich of Detail Painting for helping us get the park painted. Rich and his crew paid for most of the specialty paint, and volunteered countless hours to ensure it was ready for the June 5th dedication ceremony. We cannot thank these wonderful volunteers enough for their dedication and commitment to the Grant community. Parents of children using the park should remind users to always use trash receptacles or they will get a ticket for littering. Park users should also read and abide by the posted rules, encourage others to do the same, and use common sense to avoid any problems. The Ryan Benson Memorial Skatepark is family-oriented and was designed for all users to enjoy.